Mujitsu and Tairaku's Shakuhachi BBQ / need suggestions - what would be the best learning book for me? » need suggestions - what would be the best learning book for me? need suggestions - what would be the best learning book for me? Ive been learning bohem flute for about 9 years and that makes it about 14 years (maybe even more) of Bohem flute playing(and some fooling around with Tin Whistle). I would like you to suggest me a good learning book for that level. I can get decent sound out of my home made bamboo shakuhachi (well i might get a yuu when ill be able to afford it) and reach almost 2 full octaves. I can fool around and improvise but i would like to get forword with it. I would get lessons, but the thing is that i gona start really intense first year at the university in 2 weeks so I guess ill be kind of short on both money and cash this year. So, for that reason, i think a book would be best for now... and i will see where to go on later. I read that "Blowing zen" has both but it lakes with the cd autio part so would that still be the best book for me to get? Re: need suggestions - what would be the best learning book for me? Hmmm, so 'we' can assume that you've tried ALL the books, and that is your final assessment? I'd agree, that as far as books go, Chris' is better than most. Nothin' about makin' 'em in it, though. Now playing them, making them all in one book? Not published. I'd say don't try to make one until you can play one, or you won't know what you are doing. Haha! Thats true at some point! I started to make my own shakuhachi 2 or 3 years before buy my first shakuhachi instructional book... although my first flutes didnt played everything that a shakuhachi should play (at that time I didn't knew what shakuhachi involved), they helped me to learn lots of things, even that the utaguchi angle was not to fit on the chin, hahahahauha... those were nice funny days! Ive been learning bohem flute for about 9 years and that makes it about 14 years (maybe even more) of Bohem flute playing(and some fooling around with Tin Whistle). I'm in about the same situation as far as silver flute experience. ... So, for that reason, i think a book would be best for now... and i will see where to go on later. I tried 3 books. The first was James Schlefer's exercise book, great daily exercises, but as others pointed out, it's not a teaching book. Then I tried Tokuyama Takashi's "Take No Michi - the path of bamboo". The first half of the book is very basic, I pretty much skipped it except to learn some notation. It's laid out very well with short musical pieces that get progressively harder. I've had it more than 6 months and the last couple of pages I still can't get to sound good, so the despite the very simple beginning, the book is one that an experienced silver flute player but new to shakuhachi (like me and you) can sink his teeth into. The only problem with "Take No Michi" is that while it has interesting short pieces of music (including some Japanese children's folk songs), it's light on the more common popular Japanese folk songs. For that I'm using Yoshinobu Taniguchi's "How to Play the Shakuhachi". This book wasn't meant as a stand-alone teaching book, but along with "Take No Michi" you can figure out how to play most of the pieces. So since your musical background is somewhat similar to mine, for less than $100 dollars those last 2 books combined could keep you occupied and learning for what I'd guess would be a good year or so. I really don't want to discourage you from taking lessons, but given your background and monetary constraints it seems like a good alternative. 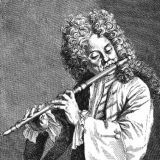 I have a hunch that those without a fair amount of experience with silver flute (or Irish flute or ney or some other non-fipple flute) might find it too overwhelming to go it alone. First, im sorry for reposting the question, the thing is, ive been browsing this forum but i didnt found something that i could take that it would fit me specifically. 2>I HAVE NO CHOICE! (i cant afford much at the moment especially a flute for a few hundred bucks). Keep having fun... thats important! Ya, take your time. There is no rush. Just enjoy the moment.